Elephant Love: A Week Volunteering at Journey to Freedom, Thailand — 2checkingout | travel and adventure | Inspiring. Capturing. Experiencing. Back in 2014 we had a life changing week volunteering at the Elephant Nature Park (ENP), 90 minutes north of Chaing Mai, Thailand. Seven fun-filled days shoveling elephant poo, washing out sleeping enclosures, unloading tons of pumpkins and bananas, making food patties, digging trenches and spending quality time admiring these gorgeous animals up close. Oh and we also made new life long friends too. Totally smitten, we wanted more elephant time but this time something different. Something more rustic with a smaller group of people and a chance to see elephants in a more natural environment. We ended up choosing an ENP sponsored project called Journey to Freedom (J2F). Situated in the hills of Northern Thailand, 3 hours from Chiang Mai. This project ticked all the boxes, including visits to a local Karen tribe village. The idea behind the project is that the local villagers bring home the elephants they own (yes we had to put ‘ownership’ to one side), ENP provides some financial support and volunteers to help make the whole experience work. Previously these elephants had been leased out to trekking camps and tourist shows. The J2F project is currently supporting 7 elephants including a 6-month-old baby. The hope is that in future more and more elephants will be brought back to the area surrounding the villages for a happier less stressful life. To continue receiving the support of ENP, the villages commit to not using bull hooks or cruelty. Each elephant has its own mahout and there are no forced activities. To provide protection for the elephants they are taken back to the village each night and kept in enclosures. During the daytime they roam through the jungle, creating a path of destruction as they search for food. At ENP the elephants are rescued from illegal logging operations, tourist camps and street begging. Now they have a huge tract of land to roam as family groups. Unfortunately, there is no food source at the park so all the food has to be trucked in and prepared by volunteers. In contrast, the J2F camp is a small collection of rustic bamboo huts approximately 15 minutes drive from the nearest village. Cold showers, hard mattresses on the floor and three vegetarian meals a day are the luxuries on hand. We were lucky enough to blag the 'honeymoon suite'. This required a clamber over a fence then across a rickety bridge for a night time pee, well for one of us anyway. There were a total of 14 volunteers during the week we visited. Not saying that they were all youngsters but we were nicknamed Mom & Dad, at least it wasn't Grandma and Grandpa. Our fun-loving bunch of international kids came from Canada, UK, Belgium, China and USA. The two ENP coordinators, One and Dan, cooked all our meals and planned our daily activities. Dan keeping everybody entertained with his general craziness. 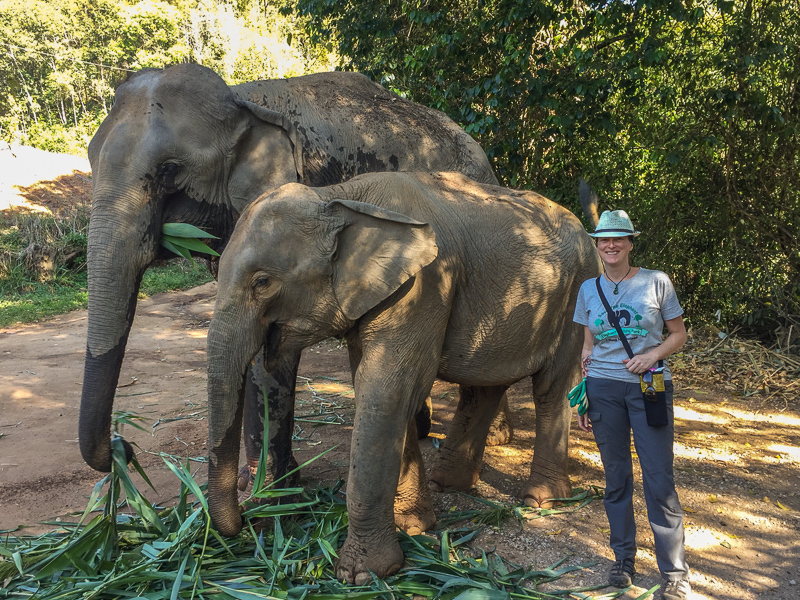 As there are only 7 elephants (compared to 30 at the main ENP in 2014) we got to spend quality time hanging out, observing their personalities, and watching the elephants munch their way through the Thai jungle. Most days we would hike a good 40 minutes to locate the elephants. Adrenaline levels blew through the top of the gauge when you realized that you were standing between the elephants and the next juicy tree. The elephants are equipped with all-terrain 4 wheel drive. It’s hard to believe that they don't topple over as they clamber steep banks to find a great tree for a back scratch. Being so close to these majestic animals has an incredibly calming influence. We would have our own picnic lunch whilst Mae Yui and her seven-year-old calf Mae Bouy searched for their own leafy snack. Minutes turn into hours very quickly. One and Dan had to drag us away when it was time to head back to camp. Kili, the 6-month-old baby along with Mum, Mae Boon, are kept in a special enclosure deep in the countryside. At one stage I thought we were going to be blindfolded so we wouldn't know the secret location. Not that any one of us would have found our own way back in a month of Sundays. They are kept here until Kili is big enough to follow Mae Boon up the very steep slopes of the surrounding hills. When junior saw us arrive she bounced up and down like an excited puppy, we were some brand new toys to play with! We sat around the lip of the hollow and watched as Kili tried to scamper up the dusty slopes to greet her new buddies. The first recipient of some baby elephant love was Julie who was giddy with excitement, as several hundred pounds of elephant somehow scrambled up the bank and tried to sit on her lap. We sat in awe and watched junior play for the best part of a couple of hours. Occasional Mum would get a little agitated if she felt we were getting too close or monopolising Kili. Thankfully this little lady will not have to undergo the heart-breaking Phajaan process of having her spirit crushed for the sake of the tourist dollar. Work-wise we spent time weeding several terraces that will be used to grow elephant food as well as spending a morning cutting bamboo-like grass for feed. There is also a plan to plant some coffee plants so that the beans can be sold to visitors and villagers. We shifted a couple of hundred breeze blocks that will be used to build an enclosure for Zuki (three-years-old), who was abandoned by her Mother and has some special needs. Compared to our time at ENP the volunteer work took less time but was more physically demanding. A couple of afternoons we piled in the back of the pick-up and headed to the village and hung out with some of the local kids. Some were very shy whilst others wanted to practice their English. We took a group of them on a litter collection walk around the village. The kids trying to out vie each other by seeing who could collection the most rubbish. Our second visit was to a nursery school where after a little period of awkwardness we had heaps of fun teaching the small kids ‘heads, shoulders, knees and toes’. Then the play dough came out and our artistic talents were pushed to the max. Before playing 'how many kids can sit on Steve and watch video clips of the elephants'. Billy (from the UK) one of our co-volunteers didn't have quite the same level of fun as several kids took to punching and biting him. Maybe they had heard the reputation that West Ham fans have. For our last night, we trucked and bused from the village to the Elephant Nature Park. Julie and I were blown away with the amount of change that had happened in the last three years. The number of elephants has risen from 30 to 70. They have acquired large tracts of land on the other side of the river where many of the new elephants are kept. The elephants are no longer chained at night, now sleeping ingroup enclosures. Unfortunately the elephants still have to be locked up in the evening. A small price to pay for the love and attention they receive. We scored a great room for the night with a view of the river where several elephants were just chilling. For our final morning, we had a guided tour of the park visiting the different family groups, some with young. We also met up with a number of the elephants that had been injured by land mines or from back-breaking logging. Unfortunately the founder of the park, Lek, wasn't on hand during our brief stay. On our previous visit we were very fortunate to spend 40 minutes chatting one-on-one with Lek whilst sat below some elephants feeding them fruit. These two experiences were very different, both give you plenty of quality time with the elephants. If you are short on time and only have a couple of days to spare then the overnight stay at Elephant Nature Park is for you. If you like the finer things in life, like a bed rather than a mattress on the floor or the choice of a dozen delicious vegetarian dishes at every meal time, then ENP is the place for you. Journey to Freedom is very rustic, no wifi and next to no mobile coverage. It is a great escape with the added benefit of being as close as you can get to elephants in a natural surrounding exhibiting nature behaviours. It's impossible not to walk away from ENP or J2F an elephant advocate. Our enthusiasm for Elephant Nature Park has already seen one of Julie’s good friend's Rohit and his partner Mark spend a week volunteering. Hopefully next time they will make it to ‘Journey to Freedom’. The tireless work that Lek puts in to saving these wonderful animals is unbelievable. In the wild the Asian elephant has been pushed to the edge of extinction. There are more domestic elephants than there are wild ones in Asia. The work that is going on at ENP and sponsored projects is trying hard to reset that balance. Volunteering at ENP means that are you making a direct contribution to save the Asian elephant. No need for rides, paintings, or any other party tricks. Just elephant love. Cost of volunteering at Journey to Freedom as of May 2017 - 15,000 Baht (NZ$632), includes transfers to and from Chiang Mai, all meals, accommodation and final night at Elephant Nature Park. Newer PostWant to Ride an Elephant? How to Choose an Ethical Alternative and Why.